Summer is officially here which can only mean one thing… three months of indoor hibernation! But just because the temperature is soaring, doesn’t mean we can’t still enjoy summer in Dubai. From incredible 50% discounts at Nikki Beach Resort & Spa Dubai to 2-for-1 offers at Palace Downtown, treat yourself to some well-deserved R&R with these awesome summer spa deals. Treat a loved one this summer and make the most of the 2-for-1 offer at The Spa, Palace Downtown. Take your pick from any 50-minute treatment and enjoy another 50-minute treatment for FREE! What’s more, you’ll also get access to the spa’s oriental bathhouse, steam room and Jacuzzi. This summer, UAE residents get to enjoy an incredible offer at Atlantis’ ShuiQi Spa with the ‘Pamper Me’ package. The offer includes a 75-minute treatment and massage, a three-course lunch at The Edge, all-day access to the Royal Pool, Zero Entry Pool and Royal Beach, as well as 10% discount on Aromatherapy Associates products. Head down to Downtown Dubai’s Address Boulevard this summer for an Exclusive Cabana Journey. Offering a 90-minute spa experience with a view, you’ll get to enjoy a hot stone foot massage in a private cabana, an anti-aging facial, and access to the infinity spa pool, vitality pool, experience showers and ice fountain. With Friendship Day coming up on July 30, Shine Spa at Sheraton Mall of the Emirates is offering you and your bestie the ultimate day of pampering. Take your pick from the spa’s relaxing array of massages, exfoliating body treatments or cleansing facials – all of which come with a 50% discount. For two whole months this summer, SensAsia Urban Spa is offering 40% discounts on its seasonal Summer Massage Party menu. From limited-time only massages to its popular prenatal Yummy Mummy-To-Be massage, everyone will be able to make the most of SensAsia’s awesome deals. The luxurious Nikki Spa at Nikki Beach Resort & Spa Dubai is offering 50% discounts this summer on eight of its signature treatments. Whether you’re in need of a boost after travelling or looking to prep the skin before a big party, Nikki Spa has something for everyone. You’ll even get access to the spa’s impressive sauna, steam room, ice fountain, mixed vitality pool, and indoor and outdoor relaxation lounges. Treat yourself to four 50-minute weekday spa sessions at Armani/SPA in Burj Khalifa and get ready to enjoy a relaxing summer. From body scrubs and body wraps to massages and facials, you can book your package for one full day of treatments or spread them across 30 days. You’ll also get full access to the Armani Terme thermal bathing facilities and spa lounge. Don’t let the pampering stop there! 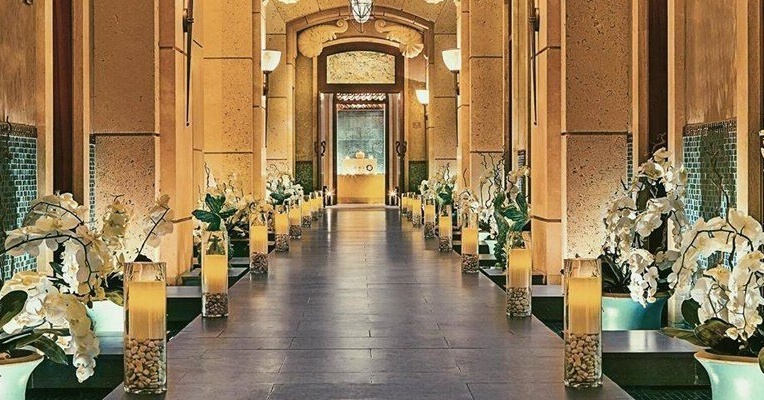 Make it a summer to remember and check out these top spas for oxygen facials, reflexology foot massages and traditional Thai massages in Dubai. next7 Beauty Brands You Didn’t Know Had Travel Size Options!